Thanks to it's great strength and stability, the Isabella Universal Dawn 420 porch awning can be put up in all weather conditions – all year round. 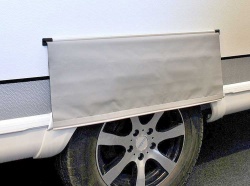 Two support poles press the sewn-in foam pads securely against the side of the caravan, while click profiles hold the sides directly on the support pole for a perfect seal. 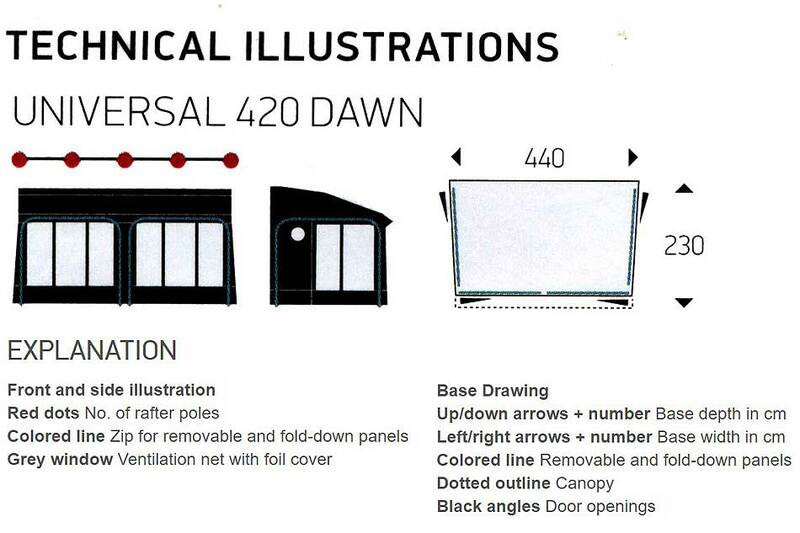 The Universal 420 Dawn has doors in both sides and large windows across the front, giving a good view. 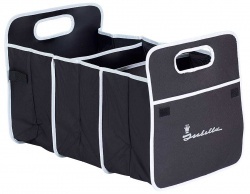 The strong Zinox steel frame ensures good stability. 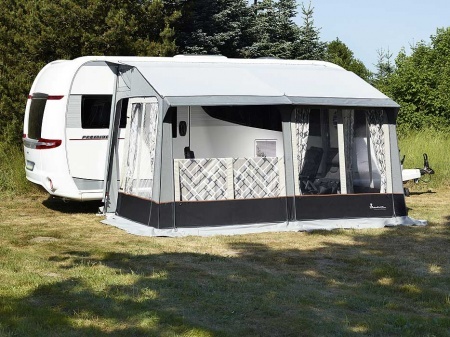 If the Universal 420 Dawn is to be used as a year-round awning, Isabella recommend the fitting of winter securing and an inner roof (optional extras). The roof construction provides unobstructed opening of the caravan door and minimal build-up of snow. Universal Dawn is part of the Dawn style concept, i.e. a mild and subdued tone-on-tone colour scheme inspired by the misty morning landscape. 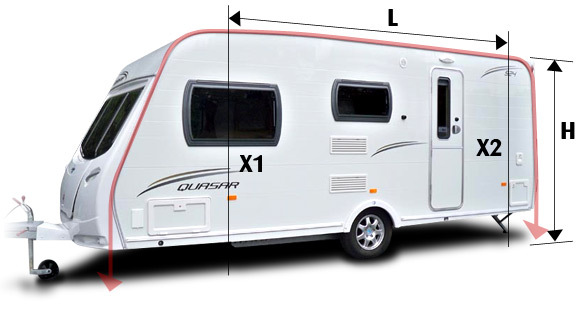 Suitable for fitting to caravans with a height between 235cm and 250cm, the Universal Dawn 420 has a depth of 2.3 metres and a width of 4.4 metres. The porch awning has four doors and large windows across the front allowing plenty of light into the awning. 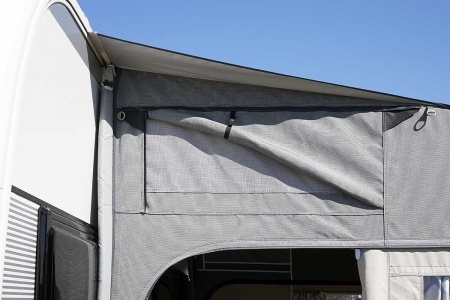 The awning comes with strong steel Zinox poles that are galvanised both inside and outside and give great stability to the awning. 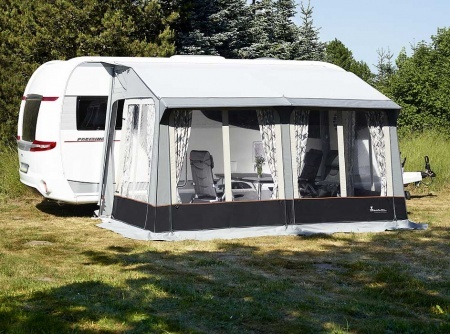 However, it is recommended that a winter securing set and an inner roof be fitted if the awning is to be used through the winter. Special Details: Comes with external mud flap. 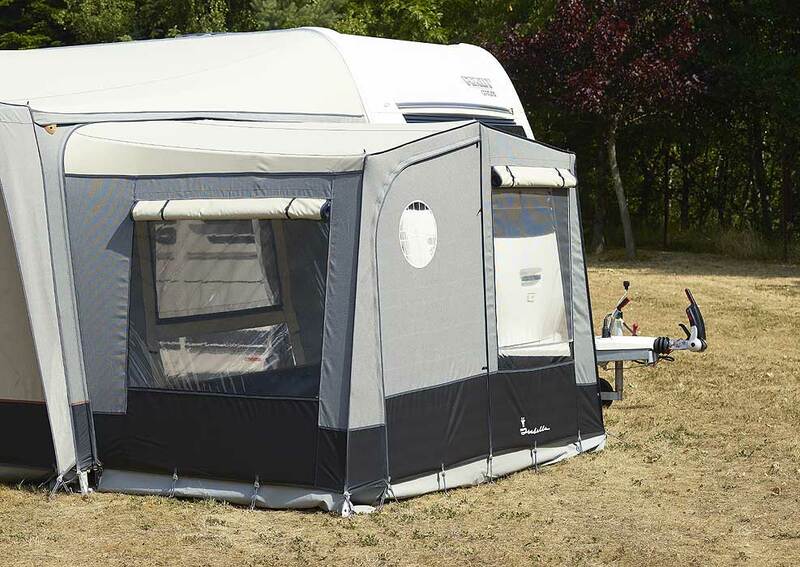 Has special sloping roof which makes the awning suitable for year-round camping. Ventilation: There are ventilation flaps at the top of both the left and right side. Canvas Material: Isacryl 295g/m2 - Isacryl has the highest achievable fade-resistance thanks to the pigmentation method. 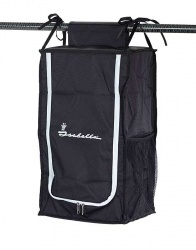 The density of the weave plus the impregnation all the way through prevents water ingress. Nevertheless, Isacryl is a breathable material, which facilitates the best possible indoor climate in the awning. Roof Material: Isaroof 285 g/m2 - a UV protective acrylate coated polyester, with an added top coat in 3 layers. Frame Type: Zinox Frame - a durable tubular steel frame with welded corners and double screw lock on the poles. 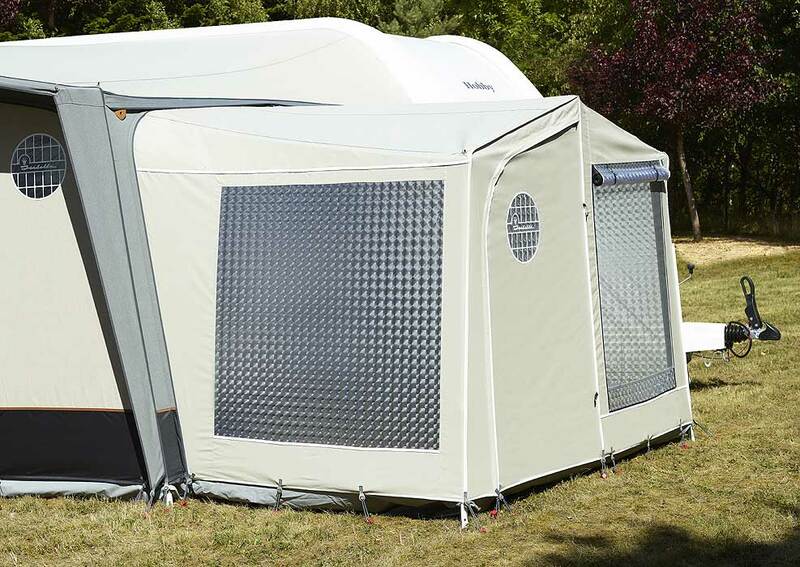 MegaFrame is designed for year-round use with a full awning which can remain standing all year. 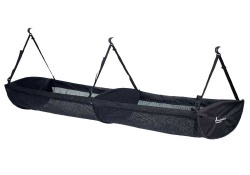 The Zinox MegaFrame is supplied with two extra rafter poles, as well as one Hercules 32.5mm.